One thing I love about the Old School format is that it allows decks to be built around cards which are almost unplayable in other formats. While scanning the Old School card pool for the n-th time, I found three cards which seemed obviously strong to me but completely ignored in the current metagame. The cards were Land Equilibrium, Mana Vortex, and Copy Artifact. Land Equilibrium is very strong in the early game when it is capable to restrict the land count to two or less. Most decks do not function well on only two lands and Mana Vortex often comes down before they find a solution. This, for many decks represents a hard lock, more difficult to overcome than a first turn Nether Void. The synergy with Mana Vortex is so strong that I knew that I wanted to build a deck based around the two cards. 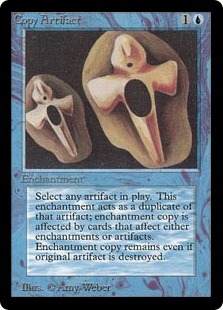 Another card that seemed strong on paper and in initial testing was Copy Artifact. Casting Juggernauts and Su-Chis for 1U seemed unfair, and considering that Vintage Stax often plays four copies of a card that essentially does the same thing for one more mana was intriguing. Copy Artifact is strong not only due to its low casting cost but also for its flexibility. In the early game in mana light hands it can copy a Mox or Sol Ring, while in the mid and late game it can copy big creatures or card drawing engines. In fact, Copy Artifact might well be the strongest unrestricted, yet underutilized card in the existing metagame. To make Land Equilibrium and Mana Vortex work, we need to break its symmetry. One possible option is to pursue a tempo based strategy that tries to land a thread and then follow up with a Mana Vortex to stall the opponent long enough to get things done. The next strategy we want to analyze is to play fewer lands, combined with a low mana curve and another means of generating mana, for which there exist two options: mana elves and mana artifacts. 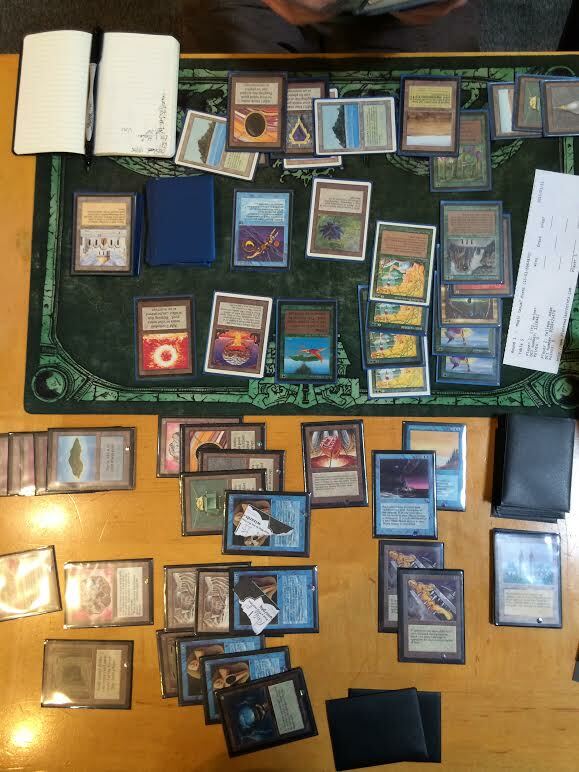 The first version of the deck started out with a low land count, with 4 copies each of Llanowar Elves, Birds of Paradise, and Elves of the Deep Shadow. Being able to generate black mana, I tried cards like Dark Heart of the Wood, Nether Void, and Xenic Poltergeist to further support the mana denial plan. This initial version of the deck appeared to be very clunky. The three color mana base had its problems, and the cards didn’t synergize well enough. For example Nether Void asks for a very high land count, whereas Mana Vortex requires the opposite. However, the biggest problem turned out to be the mana elves themselves. As the deck did not play any other creatures, opponents would quickly aim their Lightning Bolts and Swords to Plowshares at my Elves, not allowing me to build up enough mana to cast my broken cards fast or often enough. There may very well be more different ways to take this deck, for example by including Enchantress and probably a better win condition, but this is what I ended up with. To address the problems above, I tried a tempo based strategy replacing all the mana creatures with artifact accelerants, including 4 Fellwar Stones and, depending on the local Restricted List, 4 Mana Vault and Mishra’s Workshop. The challenge now was to find the right artifacts that would synergize with the land denial plan. The first version supported 4 copies each of Juggernaut, Su-Chi, and Triskelion. Using the acceleration pieces and Copy Artifact I would frequently be able to cast two critters on turn two, and then seal the deal with Equilibrium/Vortex on turn three to prevent the opponents to build up their resources or position. The deck could be truly broken and had some good matchups. Almost all creature decks were favorable, but it had problems against UWx Weissman Control and UR Control, the two format dominating decks. Weissman Control would Plow or Disenchant the first critter to buy time, and then drop a Moat, making all of my creatures useless. I tried Tetravus to evade Moat, but couldn’t make it work. 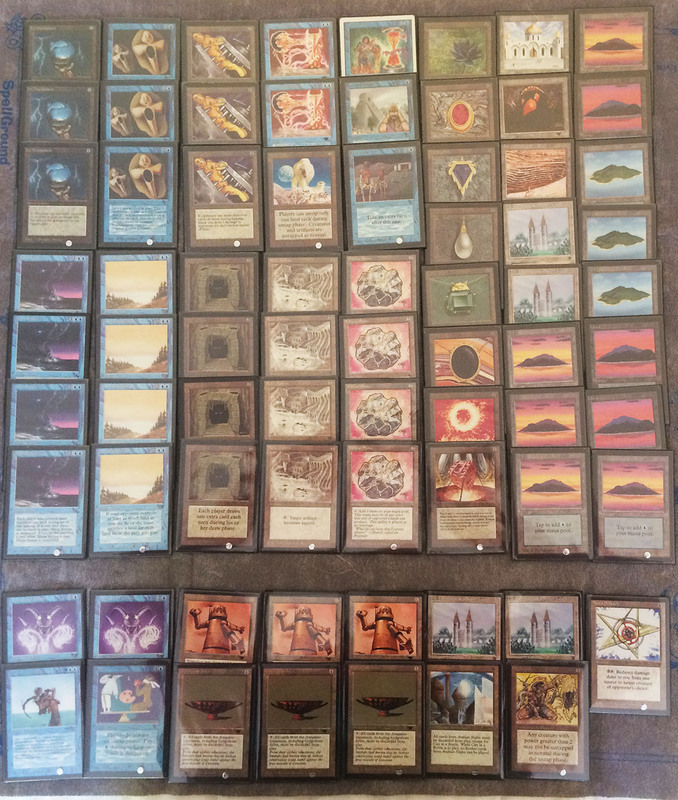 Apropos metagame, while decks including the recent Atog variants, Erhnam Geddon, and Tax Edge convey the impression that Old School exhibits a balanced and healthy metagame, I feel the exact opposite is the case. Assuming the Swedish Restricted List, my testing experience shows that Weissman Control is by far the best deck, even after the Mana Drain restriction in 2013. The main reason why it is so powerful are undercosted spells like Swords to Plowshares and Disenchant, which trade with much higher casting cost spells and, of course, Moat. Moat alone pretty much destroys any creature strategy, as there exist only a handful of playable flying creatures, and it’s almost impossible to remove if not playing White. Then the card advantage always pulls Weissman Control ahead as the game progresses. The only deck I’ve found that can reliably compete with Weissman Control is UR Control, which attacks the only weakness of Weissman (the mana base), with Blood Moon and Energy Flux. Given this metagame observation, I wanted my Equilibrium deck to have a favorable game against Weissman Control first and foremost, and a decent game against creature decks. To attack the Weissman angle I saw two openings: attacking the mana base, and rendering many of the strongest cards useless by playing zero creatures. Based on these principles I started working on a new variant of the deck. First, I needed some more blue or artifact cards to attack the opponent’s mana base. Early testing had revealed that while Mana Vortex + Land Equilibrium could be game breaking, artifact accelerants played by the opponent often were a problem. Hence, I added four copies of Relic Barrier and Icy Manipulator. Howling Mine was an obvious addition as it combos with Barrier and Icy and I rounded out the deck with two Transmute Artifacts to fetch relevant combo pieces, and the three broken blue cards. Two issues remained. I needed a win condition, and to somehow address the creature matchup. Black Vise (if unrestricted) turned out to be very strong. It synergizes great with the overall game plan of not allowing the opponent to play spells. Secondly, a double Black Vise opener can steal a game on its own, and with Copy Artifact the deck frequently has three or four Vises in play. Often, Mana Vortex + Land Equilibrium only represents a soft lock, which the opponent can overcome after a couple of turns, and in this case Vise is often enough to win the game. It is also a good answer to Library of Alexandria, and combos well with Howling Mine. For example, in many games I would use my Relic Barriers to tap down opponents’ Moxen instead of my Howling Mine if I have a Black Vise in play, allowing them to draw extra cards in exchange for damage. The decision of whether to play the tempo or the card advantage game can be truly challenging, and makes the deck a lot of fun to play. Lastly, the creature matchup had to be addressed. While the deck is capable of locking out and killing the opponent before he builds up a board, in particular weenie decks are often able to play some cheap creatures. A transformational sideboard consisting of Su-Chi and Triskelion represents a valid response, but with The Tabernacle of the Pendrell Vale there exists a card, which synergizes even better with the rest of the deck. Here is the current version of the deck. My sideboard has evolved quite a bit since playing the deck at Eudemonia. Whereas my last sideboard ran a lot of random cards, it is now really tight. First, you want to address weenie creature decks which are difficult to beat as they can operate on very few mana. For example, a resolved Sol Ring and 2 Savannah Lions are hard to beat even with Tabernacle and no other land in play. I worked quite a bit on the white weenie matchup which gets increasingly worse after they sideboard Dust to Dusts. Running the full set of four Tabernacle together with Winter Orb and Stasis as a board sweeper however has been working fine for me. Triskelion and Old Man of the Sea is also great in this matchup. Maze of Ith is best against big creature type decks but goes in here as well. Nova Pentacle represents another great colorless solution against creature decks. Except Serendib Efreet and Erhnam Djinn, Pentacle takes out pretty much every other creature and usually stops the opponent from attacking if not addressed. Note that it also works with direct damage, so if your opponent is smart enough to throw a Psionic Blast at you, take out one of his creatures instead of suffering the damage. The next issue that needed to be addressed were opposing Energy Fluxes which single handily destroy this deck. Not only does Flux shut off the draw engine and tap down artifacts but it also removes half of our mana base. Unfortunately, there exists no blue card to remove enchantments which is why after a long search I settled on Golgothian Sylex. Seriously, you might ask it is so much worse than City in a Bottle. Yes this is true, but it is still the best I could come up with besides running a second color which didn’t work out as well. If you know that your opponent runs Energy Flux you either have to have a great hand (e.g. first turn Equilibrium) or you have to mulligan into a hand with either Sylex or Transmute Artifact. Fortunately, as soon as you have one in play most decks that run it, including Red-Blue Agro Control become a good matchup. I rounded out the board with two In the Eye of Chaos, which are great against all decks running counterspells. Finally, the City in the Bottle is a great Transmute target against any deck that runs Library of Alexandria, City of Brass, or Djinns and Efreets. Fellwar Stone, Fellwar Stone, Island, Mishra’s Workshop, Mana Vortex, Black Vise, Library of Alexandria. This represents a great hand. I would lead with the Library, then drop Shop and two Fellwar Stones on turn two. Against blue decks, this allows for a 3rd turn Mana Vortex, which in combination with the card draw and Black Vise should lead to a quick win. It also would allow you to potentially milk Library for card advantage of course. 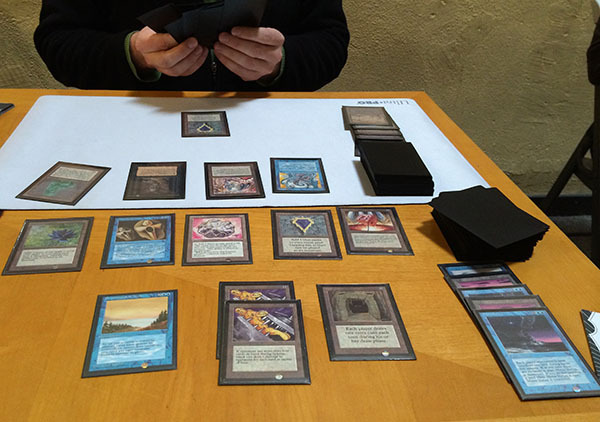 Howling Mine, Mox Ruby, Mox Emerald, Fellwar Stone, Island, Transmute Artifact, Timetwister, Black Vise. Another strong hand. First turn we drop all our accelerants and Black Vise, followed up with a second turn Timetwister to refill our hand. If it gets countered we can still transmute for Relic Barrier to control Howling Mine and simply outdraw our opponent. Howling Mine, Fellwar Stone, Relic Barrier, Sol Ring, Black Vise, Mox Pearl. Again we can drop all of our accelerants on turn one and then follow up with the Relic/Mine combo on turn two. Mana Vortex, Copy Artifact, Relic Barrier, Black Vise, Island, Transmute Artifact, Mox Sapphire. This hand is mana light and shows the power of Copy Artifact. We can open the game with Sapphire, into another Sapphire copy into Black Vise. We can then disrupt the opponent with Mana Vortex and Relic Barrier, and possibly Transmute into a Howling Mine later in the game to take over. Black Vise, Black Vise, Ancestral Recall, Mana Vortex, Howling Mine, Sol Ring, Relic Barrier. Even on the draw this is sketchy, so we mulligan into: Island, Copy Artifact, Vortex, Transmute Artifact, Tabernacle of the Pendrell Vale, Black Vise. With not enough mana to really do anything we mulligan again into: Island, Island, Taberncacle of the Pendrell Vale, Howling Mine, Mana Vortex. Still a bad hand, but possibly a keeper. We should try to reset the game as soon as possible with Mana Vortex and try to draw into Relic with our Mine to make up for the card disadvantage. 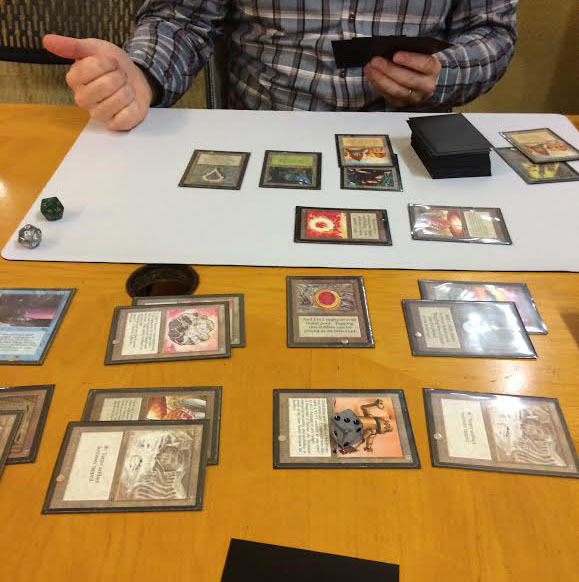 Fellwar Stone, Land Equilibrium, Island, Mox Ruby, Mox Pearl, Relic Barrier, Island. This represents an amazing hand. On the play we can drop Island, Mox, Mox, Fellwar Stone. Against a blue opponent we can drop Equilibrium on the second turn without playing the second land stalling the game on a single land for the entire game. Relic Barrier will tap down an opponent’s Mox during upkeep to keep him at one mana. Island, Mana Vault, Black Vise, Island, Copy Artifact, Copy Artifact, Mox Emerald. On the play, this is a risky but keepable hand. We can lead with Mana Vault and Black Vise, then drop two copies of Black Vise on turn two. If the opponent ended the first turn with seven cards in hand we probably win this game. On the draw this hand is obviously not very good. In general, the more controlling the opponent’s deck, the better the matchup becomes for us, as they tend to have more cards in hand, and fewer threats on the battlefield that we need to worry about. One of the best matchups for our deck. Only if they get a ton of mana artifacts into play does it get tough. A first turn Black Vise by itself is a great start against them, and Vortex/Equilibrium work at their best here. This would be a good matchup if it wasn’t for Energy Flux. Resolving a fast Vortex/Equilibrium is key to keep them on two mana. In the absence of flux this deck is usually capably of locking down the game state before life totals become an issue. Your opponent burning you out off of 2-3 mana sources is also a possibility if they draw enough cards, so be careful with how you use Howling Mine. This is a ifficult matchup. After sideboarding White Weenie will often have access to 4 Disenchant and 4 Dust to Dust, which can be tough to overcome. Also they can usually keep one creature alive long enough against Tabernacle to deal enough damage. Try to get Tabernacle into play and sweep the board using Winter Orb or Stasis. After sideboarding this becomes a winnable matchup. Good matchup for us. They have no removal, and are much more mana limited than White Weenie. Search for Icy and Meekstone to tap down a fast Juzam or Hypnotic Specter. This depends on the amount of post-board artifact hate. Armageddon often backfires, as a Tabernacle will often clean the board. Mishra’s Workshop: I am still not sold on this. This deck is so reliant on the UU Enchantments such that only providing colorless is a big problem. Often Workshop will provide a boost only in the first two turns to drop a couple of Fellwar Stones or if everything goes well a first turn Howling Mine + Relic Barrier. Furthermore, besides Icy Manipulator all other artifacts are only 2cc which makes the Workshop less efficient. In a sense it is worse than Mana Vault which is also one shot but can be used to cast blue spells and is a great outlet for Transmute Artifact. 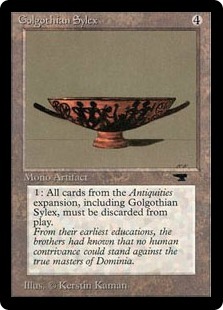 However, as soon as one sideboards Golgothian Sylexes it gets much more important. Currently, I am running 0-1, certainly 2 is the most I would run (if unrestricted in your metagame). Mana Vault: As with Workshop, I have been cutting and adding Vault back to the decks a number of times. It allows for more broken plays but reduces consistency. As we all love brokenness let’s play a single copy. Mishra’s Factory: Suffers from the same problems as Workshop not being able to generate blue mana, and the deck space is tight. Opens up targets for creature removal from the opposing deck, which would otherwise be dead in opponent’s hand. You want to play as few lands as possible such that Vortex and Equilibrium gets has an asymmetric effect, which is why I run none. Icy Manipulator: I’d play 4 if deck space wasn’t so tight. Needed against fast big creatures, and also taps down opposing mana, while playing well with your Howling Mines. Relic Barrier: Very strong card. Taps down Moxen, handles Mishra’s Factories, and combos with Howling Mine, all for only a single 2 mana investment. Winter Orb: This decks seems to be a perfect fit for this card even without the original errata/intent (to ‘turn off’ if tapped), but it isn’t. This deck is mana hungry and likes to tap down every turn. Control decks are often affected to a lesser degree as they often sit back not playing spells. The only deck it works well against is White Weenie or Zoo, where it combos with Tabernacle. Here, it is so strong such that I think playing one that can be Transmuted for is the right call. Library of Alexandria: Does not particularly fit the game plan, but too strong to not include. An unanswered Library even for a few turns is often too much for any deck to overcome. Black Vise: Initial versions only had 2 to reduce the number of potentially dead draws. However, only rarely the deck achieves a hard lock where drawing into a win condition can take arbitrarily long. With three copies plus Copy Artifact a soft lock is often enough to finish the game before the opponent can find an answer. The Tabernacle at Pendrell Vale: Great main deck answer against creature decks. Is a multi-Time Walk against White Weenie, but will often not suffice alone, so combine it with Winter Orb or Stasis to sweep the entire board. Candelabra of Tawnos: The strength of this card is that all your Moxen can now produce U (with a sufficient number of islands in play). It also works nice with Maze of Ith, Workshop, and Library, but as it does not produce mana on its own so I always wanted an Island in its place. Mana Drain: It does not fit the game plan but by combining Counterspell and Dark Ritual in one card it might be good enough. I am still testing it and so far it is promising but I haven’t made a decision yet. Island of Wak-Wak: If sideboard space wasn’t so tight I would play one as it’s another Maze of Ith against decks that play Serendibs. This is a fun deck and you should try it out. It plays a lot different than any other deck in the format and can make a lot of very broken plays. It has a shot against any deck in the meta, although every matchup is tight. It is difficult to play, rewards play skill, and requires a lot of practice. The deck lacks a bit of consistency as some of its cards values depend on the synergy with other cards. Also, cards like Equilibrium are very strong by themselves, but they do not benefit from having multiple copies in play. In many regards this deck plays like Vintage Stax. Mana Vortex represents the pendant to Smokestack, Relic to Tangle Wire, and In the Eye of Chaos to Spheres. As with Stax, it is paramount to prohibit the opponent to build up a mana base, so attack it fast and aggressively. This deck definitely benefits from the unrestriction of Black Vise. Unrestricting Strip Mine could further improve this deck, so modify accordingly to your local Restricted List. I feel that the biggest drawback of this deck is its susceptibility to one of the formats best hosers: Red Elemental Blast, Energy Flux, and Dust to Dust. Watch out for these, and sideboard accordingly!